Revenue in the eBooks segment amounts to US$3,960m in 2019. Revenue is expected to show an annual growth rate (CAGR 2019-2023) of 3.2%, resulting in a market volume of US$4,485m by 2023. User penetration is 13.7% in 2019 and is expected to hit 15.5% by 2023. The average revenue per user (ARPU) currently amounts to US$7.00. In global comparison, most revenue is generated in United States (US$5,487m in 2019). An eBook is the digital or electronic version of a book and can be read on various devices such as specific eReaders (e.g. Kindle) as well as on tablets, smartphones or computers. eBooks include fiction, non-fiction and textbooks/academic literature. Paid downloads are offered in online stores such as Amazon or iTunes and also in selected brick-and-mortar bookstores or via online self-publishing platforms. Open access literature is not included. 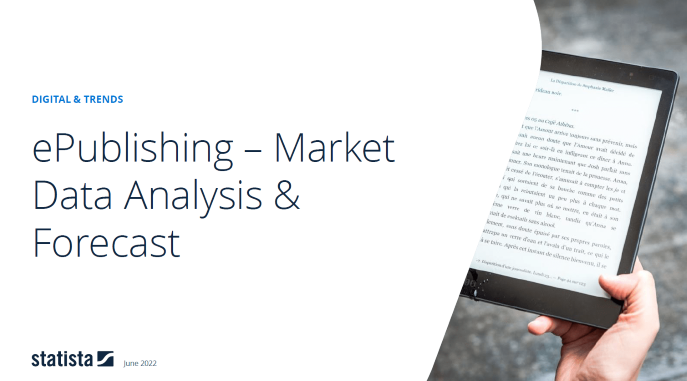 Reading Support Revenue in the eBooks segment amounts to US$3,960m in 2019. Reading Support The eBooks segment is expected to show a revenue growth of 4.7% in 2020. Reading Support In the eBooks segment, the number of users is expected to amount to 662.0m by 2023. Reading Support User penetration in the eBooks segment is at 13.7% in 2019. Reading Support The average revenue per user (ARPU) in the eBooks segment amounts to US$7.00 in 2019. Reading Support With a market volume of US$5,487m in 2019, most revenue is generated in United States. Reading Support With a rate of 25.1%, the user penetration in the eBooks segment is highest in United States. Here you can find more studies and statistics about "eBooks".